It's January and you want to keep bees this "Summer". Well, don't wait until May to get started because you will be out of luck. Your beekeeping year begins now. "Why so early? It's just past the New Year!" you say. There are several reasons why. If you live in the Northern United States your beekeeping window of opportunity closes pretty quickly by the middle of April. That is when beekeepers who produce package bees for sale are most likely already sold out. They are located in the Southern states and California and are offering bees for sale now for delivery in April and May. A small number of beekeeping companies offer nucleus hives for sale but they can't be shipped and you may have to travel pretty far to go get them. They are usually ready for purchase in late May or early June. That is why you should be using this time not just to find a source of honeybees but also to prepare yourself and your bee yard (and possibly your neighbors) for the coming beekeeping year. Here is what you need to do. By a good beekeeping book or two and read them at least twice all the way through. The Winter before I began serious beekeeping I read one basic beekeeping book, 2 books on beekeeping history and a book about nectar and pollen source plants. That was in addition to the charming beekeeping story books that inspire a lot of people to keep bees. I got to them after I got hooked. 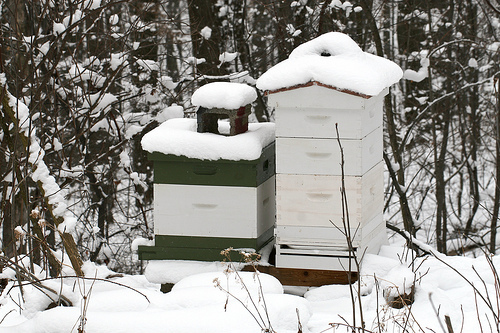 Figure out whether you even have a decent location to put your bees. A small backyard with a couple of kids and a dog or two is not a good location for a bee hive. You need to place your hive where the activities of people won't interfere with the flight pattern of the bees. Also, be considerate and ask your neighbor's permission first. Use the time of cold weather to figure out what supplies and equipment you will need, order it and assemble it. Yes, unless you want to pay a lot more, it is wise to assemble your own bee hives. You will also learn more about the parts of a hive that way. Take a class and/or join a beekeeping group. You will benefit greatly from the experience of others and will have someone to ask when you encounter a situation that confounds you, which will happen regularly. Lastly, wrap your mind around the fact that you must now care for these insect animals with as much attention as you would give a family pet. These are living creatures and it is your job to make sure they stay healthy and happy. Trust me, they give back much more in enjoyment alone.